For the last couple years or so my 4-wheel-drive system has been engaging intermittently. Normally I’d shift the transfer case lever into 4 High and the green lights in the instrument cluster, indicating the status of the front wheels, would blink (four-wheel drive engaging), then go solid (in four-wheel-drive). In the last couple of months though, the lights wouldn’t stop blinking, a sign that the system wasn’t able to engage the front axle. I had ordered the factory shop manuals for the truck a while back, so I decided to see if I could fix it myself. Also, my mechanic explained to me that my Gen 2 Montero engages 4-wheel-drive by connecting the right-front axle shaft to the front differential by means of a vacuum-powered actuator. (That’s different from the Gen 1, which has auto-locking hubs.) Armed with that knowledge I looked up the actuator in the manual and noticed that it recommended greasing the actuator rod. 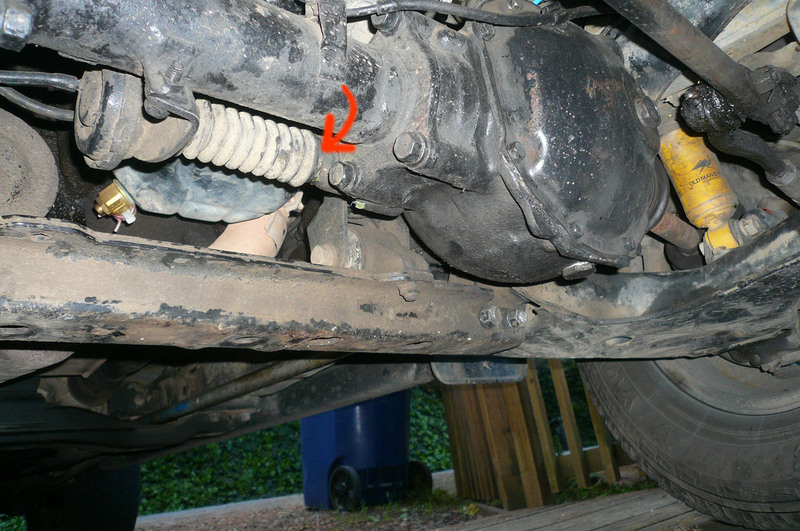 I got under the truck, removed the skid plates, pushed aside the rubber boot and saw that the grease, where the rod entered free-wheeling clutch housing (red arrow), was old and jelly-like. I cleaned out the old crud, packed it with fresh grease, reattached the boot, and left the whole thing sit while I reinstalled a pair of marker lights in the bumper. When I took the truck for a test drive an hour later and shifted into 4 High, the indicator lights flashed briefly, then immediately went solid. Whoo-hoo! An easy fix! I recently had a set of ARB locking differentials installed in the truck and it was irritating that I had this great new gear and yet the basic four-wheel-drive system wasn’t working. That made this quick fix all the more satisfying. This situation came up again recently. I think water crossings may be a factor since the boot on the actuator rod isn’t water tight. Again, I cleaned out the old grease, sprayed WD-40 to drive out any water, then re-greased both ends of the rod. It’s working again.